To Cite: Reyhani T, Sanadgol V. The Effects of Creating an Artificial Night on the Pattern of Weight Gain Among Preterm Neonates, Mod Care J. 2016 ; 13(1):e8843. doi: 10.17795/modernc.8843. Background: Advances in midwifery and neonatal intensive care have prolonged preterm neonates’ survival and their stay at intensive care units. One of the major concerns for these neonates is their exposure to strong lighting and thereby, increased metabolism in their bodies. Objectives: The objective of the present study was to analyze the effects of creating an artificial night on the pattern of weight gain among preterm neonates. Methods: This quasi-experimental study was performed in 2012 on 38 preterm neonates, who had been hospitalized at the neonatal intensive care unit of Qaem hospital, Mashhad, Iran. The neonates were conveniently selected and randomly allocated to cyclical lighting (experimental) or continuous lighting (control) groups, nineteen in each one. The data from the neonates and their mothers were collected using a researcher-made questionnaire and through interviewing the mothers, observing the neonates, and referring to their medical records. Moreover, the neonates were weighed before the intervention and also throughout the study on a daily basis. The data were analyzed via the SPSS software (v. 15.0) through running Chi-square and paired- and independent-sample t tests at a significance level of less than 0.05. Results: There was no significant difference between the groups regarding the neonates’ gender, gestational age, birth weight, age and weight at the time of entering the study, duration of not receiving anything by mouth, daily calorie intake, and the length of premature rupture of membranes (P > 0.05). After the study intervention, the mean of neonates’ weight in the experimental group was significantly greater than the corresponding pretest value (P = 0.003). However, in the control group, this difference was not statistically significant (P = 0.52). Moreover, the pretest-posttest mean difference of the neonates’ body weight in the experimental group was significantly greater than the control group (P = 0.04). Conclusions: Cyclical lighting can be used as an effective strategy to promote preterm neonates’ weight gain. During the last two decades, the number of preterm neonates has increased mainly due to an increase in the number of preterm deliveries (1). Besides, advances in midwifery and neonatal intensive care have improved the survival of these neonates. Prematurity of preterm neonates’ bodily organs leads to the need for prolonged hospitalizations (1, 2). Before delivery, the fetus is in a warm and dark environment of mother’s uterus (3). During this period, fetal innate biological clock creates daily rhythms. In the third trimester of pregnancy, this clock is affected by maternal signals (4). Immediately after birth, neonates leave the warm and dark environment of the uterus and enter a new environment, which is characterized by days and nights. Such a new environment is essential for the development of their circadian rhythms (3). One of the most important factors, which can affect the development of circadian rhythms, is preterm birth (4). Consequently, after birth, preterm neonates should be located in an environment, which is as dark as the environment of the uterus in order to promote their growth and development. In neonatal intensive care units (NICUs), lighting conditions vary during days and nights (3-5). Therefore, one of the main concerns about neonates, who are hospitalized in these units, is their early exposure to intense and unpredictable lighting or continuous dim lighting (6, 7). Rivkees (2003) noted that preterm neonates’ circadian rhythm is sensitive to light so that low-intensity light can regulate the development of their biological clock (8). Contrarily, Mirmiran et al. (2003) stated that preterm neonates’ circadian rhythm and sleep pattern are developed through the process of internal development and hence, environmental lighting has no significant effect on it (2). The stress of intense lighting is associated with faster metabolism rate among preterm neonates and hence, it can cause weight loss (3). Rivkees et al. (2004) found that cyclical lighting, which was synchronized with natural lighting of day and night, improved weight gain pattern among preterm neonates (9). Brandon et al. (2002) also found cyclical lighting more effective than continuous near darkness in increasing preterm neonates’ weight gain (10). Nonetheless, Boo et al. (2002) found that premature neonates’ exposure to cyclical twelve-hour lighting or continuous darkness did not significantly affect their weight gain (3). The results of studies by Kennedy et al. (1997) and Mirmiran et al. (2003) also illustrated that environmental lighting had no significant effect on neonates’ weight gain (2, 11). Despite the wealth of studies on the effects of lighting on neonates, careful clinical studies have not indicated that environmental lighting is harmful to preterm neonates (9). Besides, some studies showed that dim lighting neither affects neonates’ medical outcomes nor has negative effects on their eyesight. In other words, dim lighting can be solely considered as a safer intervention for neonates (7). Better developmental outcomes occur for low-birth-weight neonates, who receive medical and nursing care since their birth (5). Numerous environmental stimulations as well as different painful procedures, which are implemented for neonates in NICUs, can significantly affect the process of their growth and development. Consequently, all NICU staffs, including physicians and nurses, need to identify environmental stressors, prevent neonates’ exposure to these stressors and support them (6). Compared to other healthcare professionals, nurses are more actively involved in providing care to neonates. Therefore, identifying environmental stressors and minimizing their negative effects on neonates are among nurses’ main responsibilities. One of the strategies, which can be used to minimize environmental stressors, is to create artificial day and night. This strategy is noninvasive, incurs no cost, and can be used as a basis for organizing the delivery of other care services. It may have a significant role in producing better clinical outcomes and promoting the development of both full-term and preterm neonates. Given the conflicting findings of previous studies, the present study was carried out to analyze the effects of creating an artificial night on the pattern of weight gain among preterm neonates. This quasi-experimental study was made on 38 preterm neonates, who had been hospitalized at the NICU of Qaem Teaching hospital, Mashhad, Iran, in order to gain weight and attain maturity. The neonates were conveniently selected and randomly allocated to the cyclical lighting (experimental) or the continuous lighting (control) groups, nineteen in each group. The inclusion criteria included having a gestational age of 30 - 34 weeks, a birth weight of 1200 - 2200 gr, age of less than seven days, being afflicted neither by congenital anomalies nor pathologic apnea, and being fed through nasogastric or orogastric tubes. The study instrument was a researcher-made questionnaire, which consisted of three parts on personal characteristics of neonates (such as gestational age, birth weight, and age and weight at the time of entering the study), personal characteristics of neonates’ mothers (age and place of residence), and neonates’ nutritional intake. The third part included items such as the duration of receiving nothing by mouth (NPO), the use of Aptamil and medium chain triglyceride (MCT) oil formula, the volume of each meal, and the amount of fluid and calorie intake. The content validity of the study instrument was assessed and approved by ten faculty members of Mashhad faculty of nursing and midwifery, Mashhad, Iran. A weighing scale was also used to weigh the neonates. Its reliability was assessed through the inter-rater reliability assessment technique. Immediately after birth, the neonates in both groups were fed via a feeding tube. After twelve hours from birth (i.e., when their physiological status became stable), we started to implement the study intervention. Except for lighting, other care services provided to the neonates in both groups were the same. The study interventions were provided to the neonates in both study groups for ten days. Neonates in the experimental group were exposed to natural environmental lighting from 07:00 to 19:00 and to darkness from 19:00 to 07:00. During the darkness period, room lights were switched on and the neonates’ incubators were covered by a thick lilac linen fabric. The cover was removed only during nursing care measures or when the neonates were being fed. The amount of luminance passed through the fabric was measured using a TENMA lux meter, which was about 17 lux. As the optimum level of luminance for neonates’ sleep is 20 - 25 lux (12), the linen fabric was suitable for producing adequate darkness, i.e. a luminance of 17 lux. Throughout nights, neonates’ arterial oxygen saturation was measured by a pulse oximeter device. On the other hand, the neonates in the control group were exposed to normal environmental lighting. In both groups, the neonates’ weight was measured before the study intervention (baseline measurement) and on a daily basis throughout the study at 07:00. Daily weight measurements were performed for each neonate twice, i.e. one hour before and one hour after feeding, while the neonates were changed and worn light clothes, if any. The neonates in both groups were fed every two hours by infant formula and breast milk. Throughout the study, all neonates in both groups received kangaroo mother care whose length was measured daily. The data were analyzed via the SPSS software (v. 15.0) through running Chi-square and paired- and independent-sample t tests at a significance level of less than 0.05. More than half of the neonates in the experimental and control groups were male (52.6% and 63.2%, respectively). In the experimental group, 36.8% of the neonates received exclusive breast feeding, 10.5% received exclusive formula feeding and 52.6% were fed by both formula and breast milk. These values in the control group were 31.6%, 10.5%, and 57.9%, respectively. The number of the neonates in the experimental and the control groups, who were fed by Aptamil and MCT oil formula, was thirteen (68.4%) and eleven (57.9%), respectively. Besides, most of the neonates’ mothers in these two groups resided in urban areas (84.2% and 78.9%, respectively). There was no significant difference between the groups regarding the neonates’ gender, gestational age, birth weight, baseline age and weight, duration of being NPO, daily calorie intake, type of feeding, feeding by Aptamil and MCT oil formula, the length of premature rupture of membranes (PROM), and their mothers’ place of residence (P > 0.05; Table 1). aThe results of the Independent-Sample t Test. There was no significant difference between the groups neither before nor after the study intervention in terms of the mean weight (P > 0.05). Besides, posttest mean value of the neonates’ weight in the control group did not significantly differ from the corresponding pretest value (P = 0.52). However, this difference was statistically significant in the experimental group (P = 0.003). Additionally, the results of the independent-sample t test illustrated that the pretest-posttest mean difference of the neonates’ body weight in the experimental group was significantly greater than the control group (P = 0.04; Table 2). aThe results of the paired-sample t test. bThe results of the independent-sample t test. The trend of ten-day variations of body weight in the groups revealed that although the baseline value of the neonates’ weight in the experimental group was lower than the control group, the slope of weight loss in this group during the first four days of the intervention was less than the control group. Moreover, the rate of neonates’ weight gain from the sixth day of the intervention in the experimental group was faster than the control group so that neonates in this group reached their baseline weight much sooner than their counterparts in the control group (Figure 1). The study findings revealed that the study groups did not differ significantly from each other regarding the means of calorie intake and the pattern of weight gain. Nonetheless, the pretest-posttest mean difference of body weight in the experimental group was significantly greater than the control group (P = 0.04). These findings denote that cyclical lighting at the NICU can promote preterm neonates’ growth and weight gain. The findings showed that during the first days of the study, the neonates experienced weight loss. The amount of weight loss during these days in the experimental group was less than the control group. However, the neonates started to gain weight from the fifth day. 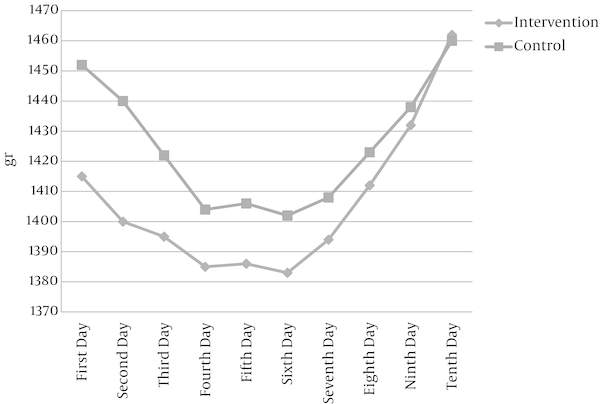 In the control group, not only the rate of weight loss during the first four days was faster, but also the rate of weight gain during the remaining days was slower than the experimental group. Consequently, the difference between the groups regarding the pretest-posttest mean difference of body weight became statistically significant. The insignificant difference between the groups regarding the pretest and posttest mean values of body weight can be attributed to different factors such as the short course of the study, small sample size, and neonates’ sleep disturbances due to mothers or healthcare professionals’ frequent visits and frequent removal of the linen cover of their incubators. Taheri et al. (2005) also studied the effects of cyclical lighting on weight gain among 66 preterm neonates and found that there was no significant difference between the pretest and the posttest values of body weight neither in the control nor the experimental groups. Nevertheless, pretest-posttest mean difference of body weight in their experimental group was significantly greater than their control group (P = 0.041) (13). Our findings were also similar to the findings reported by Taheri et al. (2005) probably due to factors such as the short course of both studies (ten and five days, respectively) and relatively small sample size of the studies. The results of other studies in this area are different from or in contrary to ours. For instance, Kennedy et al. (1997) found that neither cyclical lighting nor continuous darkness were effective in promoting preterm neonates’ weight gain. A probable explanation for such contrary findings may be the differences in the gestational and the postnatal ages of the participants of these two studies. Besides, Kennedy et al. (1997) used eye covers for the neonates in their target group, which might have been stressful for their participating neonates (11). The results of another study by Boo et al. (2002) indicated that preterm neonates’ exposure to twelve-hour cyclical lighting and continuous darkness was not effective in increasing their weight. Moreover, they found that their groups did not differ significantly from each other regarding the length of neonates’ hospital stay, the mean age at the time of regaining birth weight, the mean weight gain on the fourteenth day of their study, the mean weekly weight gain (24 gr), the mean daily weight gain, and the mean body weight at hospital discharge. They finally concluded that neither twelve-hour cyclical lighting nor continuous darkness had significant effect on weight gain among neonates (3). The difference between our findings and findings reported by Boo et al. (2002) may be due to differences in the intensity of NICU lighting, the type and the length of the interventions, and the type of care services provided for neonates. Besides, Boo et al. (2002) conducted their study on neonates, who received mechanical ventilation, while our sample included no mechanically ventilated neonates. According to Mirmiran et al. (2003), hospitalized neonates experience great stress induced by stressors such as constant and chronic exposure to poor or strong lighting, maternal separation, deprivation from maternal cuddle and deep sleep, and reactivity to light and sounds. Therefore, they conducted a study in 2003 in order to test the following hypothesis, “Neonates’ sleep pattern and circadian rhythm are developed independently from environmental lighting”. Consequently, they allocated nineteen neonates to a continuous darkness intervention and 21 to a cyclical lighting intervention. One of their findings was that sleep pattern development was positively correlated with neonates’ age (2). Besides, they found that between-group mean differences of neonates’ body weight at the age of 35 weeks (106 gr) and four months (181 gr) were not statistically significant, respectively (2). Although the length of their study was longer than ours, their findings showed the ineffectiveness of lighting procedures on neonates’ weight gain. This is contrary to our findings probably due to the differences in neonates’ gestational age and lighting intensity in these studies. In our control group, the neonates were treated with continuous lighting while Mirmiran et al. (2003) treated neonates in their control group with continuous darkness. Seemingly, continuous darkness is less stressful for neonates than continuous lighting, resulting in insignificant difference between the groups in the study of Mirmiran et al. (2003). Brandon et al. (2002) compared the effects of cyclical lighting and continuous near darkness on the growth of preterm neonates born at a gestational age of less than 31 weeks. They allocated the neonates in the cyclical lighting group to three subgroups as follows: 1. cyclical lighting since birth; 2. cyclical lighting since the 32nd post-conception week; and 3. cyclical lighting since the 36th post-conception week. The neonates in the second subgroup showed better recovery compared to the other two subgroups. They concluded that compared with continuous darkness, cyclical lighting is more effective in promoting weight gain. In other words, continuous darkness has no merit over cyclical lighting. The findings reported by Brandon et al. (2002) showed that their intervention was more effective than ours in increasing weight gain. This difference is probably due to the fact that their intervention was implemented for a longer period of time (six weeks) and with a different method compared to ours (10). In another study, Mann et al. (1986) investigated the effect of cyclical day and night lighting and continuous lighting on neonates’ weight gain pattern, and reported a significant difference between these two lighting interventions. It is important to mention that this difference was observed only after hospital discharge. In the cyclical lighting group, the means of neonates’ weight at weeks six and twelve were significantly higher than the continuous lighting group. Besides, post-discharge weight of the neonates in the cyclical lighting group was by 0.5 Kg greater than the neonates in the continuous lighting group (14). The study by Mann et al. (1986) was similar to the present study in terms of the type of interventions and the length of each 24-hour lighting course. Nevertheless, neonates’ weight gain in their study was greater than ours. Probable explanations for these differences may be differences in neonates’ gestational age, baseline age, the length of interventions, and the amount of silence at NICUs. Rivkees et al. (2004) also found that cyclical lighting synchronized with normal day and night was more effective than continuous dim lighting in increasing weight gain since the sixth week of their interventions. They found that in the continuous lighting group, the means of neonates’ weight at birth and at hospital discharge were 1110 and 2338 gr, while these values in the cyclical lighting group were 1072 and 2252 gr, respectively (9). In fact, the results reported by Rivkees et al. (2004) illustrated that day-night synchronized cyclical lighting does not significantly affect neonates’ weight gain during the first days of the intervention. The pattern of weight gain in our cyclical lighting group compared with continuous lighting group was slightly better than that reported by Rivkees et al. (2004). This slight difference can be attributed to differences between the studies regarding the neonates’ gestational age, neonates’ baseline age, the length of the interventions, and the type of care services provided for the neonates. In line with our findings, the results of a study done by Miller et al. (1995) also indicated that compared with continuous lighting, cyclical lighting was more effective in increasing weight gain among preterm neonates. They reported that the mean of weight gain in the cyclical lighting group was significantly greater than the continuous lighting group (9.4% vs. 7.4) (15). Some of the previous studies reported the ineffectiveness of cyclical lighting in promoting weight gain among preterm neonates. Discrepancies among the studies can be attributed to different factors such as the design and the length of studies. The important point here is that cyclical lighting can be beneficial for the development of neonates’ circadian rhythm. Consequently, it is better to place preterm neonates in appropriately-lit environments in order to promote their growth and development. The pattern of weight gain in the experimental group was better than the control group. However, this study cannot provide conclusive evidence concerning the effect of different lighting techniques on neonates, particularly preterm infants. Alternately, the present study can be considered as a basis for more comprehensive studies. Further studies on the effects of cyclical lighting on preterm neonates can help promote their health.